With one of the world's longest coastlines, spanning 17 states, and very high marine and coastal biodiversity, Brazil owes much of its prosperity to the ocean. 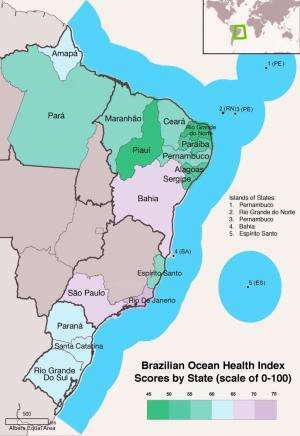 For that reason, Brazil was the site of the first Ocean Health Index regional assessment designed to evaluate the economic, social and ecological uses and benefits that people derive from the ocean. Brazil's overall score in the national study was 60 out of 100. The findings from that study—conducted by researchers from UC Santa Barbara's National Center for Ecological Analysis and Synthesis (NCEAS), the Department of Ecology, Evolution and Marine Biology (EEMB) and the Bren School for Environmental Science & Management, in collaboration with scientists from Conservation International—appear today in the science journal PLOS ONE. The index assesses ocean health with respect to the benefits and services it provides to people both now and in the future. Using a scale of 0-100, the index produces scores for each of 10 categories—Artisanal Fishing Opportunities; Biodiversity; Carbon Storage; Clean Waters; Coastal Protection; Food Provision; Livelihoods & Economies; Natural Products; Sense of Place; and Tourism & Recreation—referred to as goals. By assessing Brazil's coastal states, the research team was able to incorporate more detailed data not available at the global scale and provide more specific weighted information based on the relevance and importance of each goal to Brazil. "This is the first time we've been able to gather in a single index the environmental, social and economic goods and services provided by the ocean specific to Brazil," said lead author Cristiane Elfes, an EEMB graduate student at UCSB. "We hope to make the Ocean Health Index a program led by Brazilian institutions to monitor the status of the oceans in the long term." The first Ocean Health Index global assessment was published in 2012, with the first annual update issued in 2013. "Brazil has one of the fastest-growing economies in the world, much of which is connected to or dependent on the coasts and oceans," said Benjamin Halpern, a professor at the Bren School and a long-standing associate of NCEAS. "This growth poses the opportunity to improve the health of the ocean or to dramatically degrade it. The index provides an assessment that includes jobs, revenues, coastal protection and clean water, among many other measures, such that changes in the ocean overall can be tracked and understood. Our results provide baseline scores for each Brazilian coastal state and thus a means to identify where problems and opportunities exist as well as a framework for strategically evaluating potential management actions." 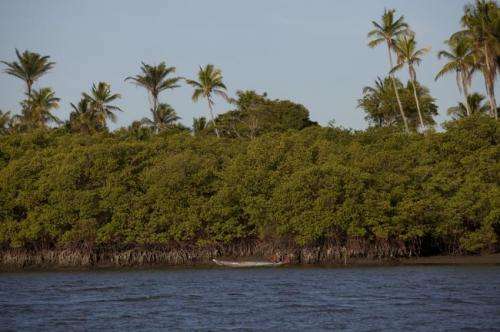 The goals of Biodiversity (85), Carbon Storage (89) and Coastal Protection (92)—all dependent on the health of marine habitats—were the highest scores. Natural Products (29), Tourism & Recreation (31) and Food Provision (36) received the lowest goal scores. Mariculture (6)—aquaculture in saltwater—received a very low score, which contributed to the low score in Food Provision. A score of 100 means the country is enjoying optimal productivity from the ocean in a sustainable way. According to the study, the distribution of tourism benefits to more states could help improve the scores for the Tourism & Recreation and Livelihoods & Economy goals. However, this would require the development of adequate infrastructure to attract and serve visitors while avoiding unwanted social and environmental effects. The low score for the Natural Products goal indicates that the country is not sustainably harvesting its nonfood ocean resources such as fish oil, seaweed and sponges. To improve the score of the Food Provision goal, the study suggests that Brazil would need to improve the sustainability of its fisheries and develop more sustainable aquaculture practices. The Brazil assessment uses local and regional data, allowing state scores to be calculated and compared but making a comparison to other country scores impossible. Comparison of country scores can be done using the Global Ocean Health Index. I wonder if they consulted the notable ocean expert Ted Danson regarding the health of the oceans? Some might remember back in the early 90's(?) when he vociferously stated the oceans would be dead in 10 years.